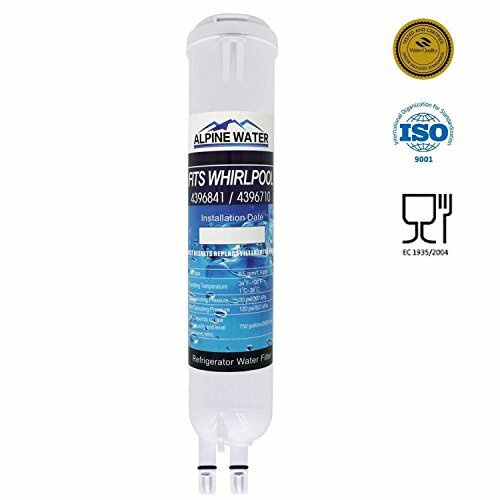 This filter is compatible for the following models,you could check if your model is listed: WHIRLPOOL--4396710 ,4396710B ,4396710P ,4396710T ;4396711B ;4396841 ,4396841B ;4396841P ,4396841T ;4396842 ,4396842B ;(Replacement Cartridge P1RFWB2 for System Models P1WB2 & P1WB2L). KENMORE -- 46-9020,46-9020P; 4609020000; 469020, 469020P. PUR -- W10121145 ; W10121146 ; W10177635 ; W10186667 ; W10193691 ,W10193691T . Compatible Models -This filter is compatible for the following models,you could check if your model is listed: WHIRLPOOL--4396710 ,4396710B ,4396710P ,4396710T ;4396711B ;4396841 ,4396841B ;4396841P ,4396841T ;4396842 ,4396842B ;(Replacement Cartridge P1RFWB2 for System Models P1WB2 & P1WB2L). KENMORE -- 46-9020,46-9020P; 4609020000; 469020, 469020P. PUR -- W10121145 ; W10121146 ; W10177635 ; W10186667 ; W10193691 ,W10193691T . Product Features:This filter use activated carbon to reduces chlorine taste, odor, sediment, dirt, rust,turbidity,heavy metals and harmful sediments .At the same time, does not remove beneficial minerals. Product Life: Product life depends on water quality and level of contaminants will last use 3-6 months or 750 gallons. Give You:Health water & Better tasting --Delivers clean, clear water, create better tasting water for drinking. If you have any questions about this product by Zen Water, contact us by completing and submitting the form below. If you are looking for a specif part number, please include it with your message.